After three years from the time he rose to power, Saudi Arabia's Crown Prince Mohammed bin Salman insists he still wants to transform his country. But it’s increasingly clear it will be change on his terms. Almost three years on, in a lengthy late-night interview on October 3 with Bloomberg, the heir to the Saudi throne—known as MBS—insists he still wants to transform his country. But it’s increasingly clear it will be change on his terms. If there’s a model the Saudi leader is following, it’s not Thatcher or even Mikhail Gorbachev. It’s more a combination of Xi Jinping and Vladimir Putin. Although Saudi Arabia has changed under the 33-year-old’s leadership, the outside environment has as well. The more than doubling of oil prices—from about $40 when he took over to $82 a barrel—has made the country’s economic challenges feel less urgent. Thanks to the change of management at the White House, the pressure to adhere to basic norms of international conduct has also eased. Both of those developments have made it easier for the regime to behave in a way that’s outraged human rights activists and onetime allies such as Canada and Germany and left the local and international business community more than a little perplexed. In the interview, the tone of the discussion is as informal as it could be in a sprawling office deep inside a palace in the center of Riyadh. The prince is imposing but dressed in a plain white thobe. Papers, books, and blue Post-it Notes with Arabic writing are strewn on a large coffee table in front of him. The officials sitting at the side of the room are both more nervous and more formally dressed. MBS has granted several interviews to Bloomberg in the past three years, and the consensus among those who have observed him since his elevation is that he’s a little more scripted than in the past. In contrast to previous interviews, he speaks in American-accented English throughout instead of Arabic. He insists that he still plans to free the economy of its dependence on oil and to press ahead with the initial public offering for 5 percent of Saudi Aramco, the state oil company, which was supposed to raise $100 billion for the country’s sovereign wealth fund, the Public Investment Fund (PIF). The listing had been promised for the second half of 2018 but is now on hold. Many thought the government had canceled out of concern investors would value the whole company at well below the $2 trillion MBS had promised. It would also have to worry about the higher degree of corporate transparency involved in listing a company in either London or New York. Not true, says the prince. The delay is simply to give Aramco the time it needs to buy a majority share in the state petrochemicals company, Sabic, and diversify its business. That will raise “$70 to 80 billion” for the PIF ahead of the Aramco IPO, which he says is “100 percent” in the national interest and will happen in “late 2020 or early 2021.” He says the grand vision for the economy is intact, albeit delayed. The prince’s supporters argue it’s too early to judge the entire reform movement, which is of historic proportions. That said, as time passes, the prince has less room for error. There has indeed been social change since 2015. Fewer women cover their faces, and others wear colorful abayas on the streets. More restaurants play music, and women are allowed to drive. These are significant for Saudi Arabia, where the majority of the population remains religiously conservative. But in other ways the regime has become distinctly more repressive. Several leading women’s rights activists and campaigners were arrested in the weeks before the driving law came into force. Many of them are still being held. Now there’s the politically explosive case of Jamal Khashoggi, which first came to light just a day before the interview and has caused a major diplomatic row. Khashoggi, a prominent Saudi critic and Washington Post columnist living in self-imposed exile in the U.S., entered the Saudi consulate in Istanbul on Oct. 2 to obtain a document related to his upcoming marriage and hasn’t been seen since. Turkish officials have said that Khashoggi was killed inside the building by a team of Saudi operatives. Since 2015, MBS has managed to get away with all manner of disagreeable behavior without losing the amity of the White House or international business. He’s not only clamped down on human rights but has also lashed out at opponents abroad, enlisting his Gulf neighbors in sanctioning Qatar and waging a costly war in Yemen that’s dragged on for three years and helped to put more than 8 million people at risk of famine, according to the United Nations. In addition, he launched Saudi Arabia’s biggest corruption clampdown, in a way that left outside observers wondering what on Earth he would do next. In late October 2017, the Saudi sovereign wealth fund welcomed thousands of international investors to the Ritz-Carlton Hotel for a grand Future Investment Initiative event, widely considered a great success. But days later, MBS directed the Saudi authorities to turn the same venue into a gilded prison for supposedly “corrupt” Saudi princes and businessmen until they handed over a chunk of their assets to the state. Businesspeople may not always care about the protection of basic human rights, but they value respect for private property and the rule of law—and they don’t like surprises. The prince is gambling he can still excite investors with grand schemes such as a $500 billion megacity called Neom and a string of resorts on the Red Sea. But there isn’t much sign of it. Foreign direct investment flows have been falling for close to a decade and declined to just $1.4 billion in 2017, from $7.5 billion in 2016. MBS says investment picked up sharply in 2018—but much of this is likely to be oil-related. Over the past three years, Saudi investment flows have underperformed the region and the world by a wide margin. Perhaps. But officials have suggested that at least some of the new jobs may come in the public sector—which directly goes against the aim to reduce the public-sector workforce. Planned pay cuts for civil servants have also been reversed. Saudi businesses would be surprised to hear that. MBS has achieved a fair amount in the domain of public-sector management and the budget. But when it comes to the basic obstacles in the way of doing business in Saudi Arabia, many would say that the reform process has barely begun. A key unanswered question relates to the role of private businesses. Though the prince insists that they are to take a lead role in the economy, all the exciting projects so far have been associated with the state-owned PIF, and the regime has shown itself more than willing to trample on the private sector in pursuit of its goals. To meet the 9 percent unemployment target, 700,000 jobs must be created over the next two years, according to Ziad Daoud, Bloomberg Economics’s chief Middle East economist. The last time the economy created that many in two years was from 2012 to 2014, when oil prices were close to $100 and the nonoil economy was growing by 5.5 percent to 6.5 percent a year. Even the government’s fairly rosy forecasts see nonoil growth of just 3.1 percent to 3.7 percent from now to 2020. There are just under 8 million expatriates working in the kingdom. So, Daoud points out, MBS could theoretically create the same number of jobs by replacing about 10 percent of them with Saudis. But private businesses resent the policies forcing them to hire nationals, who tend to be both more expensive and less productive than foreign workers. The 9 percent unemployment target is one of many that have now been deferred or watered down. Government forecasts don’t see joblessness falling below 10 percent by 2020. Instead of balancing the budget by 2019, the plan is now to achieve that by 2023, a pace that the International Monetary Fund considers more sensible. When MBS took power, the budget deficit was more than 17 percent of gross domestic product. Now it’s 4.6 percent. Overpromising is an occupational hazard for reformists attempting the kind of radical transformation that the prince said he would achieve back in 2016. But MBS hasn’t merely underdelivered, he’s also departed seriously from the script with the Ritz-Carlton arrests, the Qatar sanctions, the activist clampdown, and now the highly damaging speculation about Khashoggi. 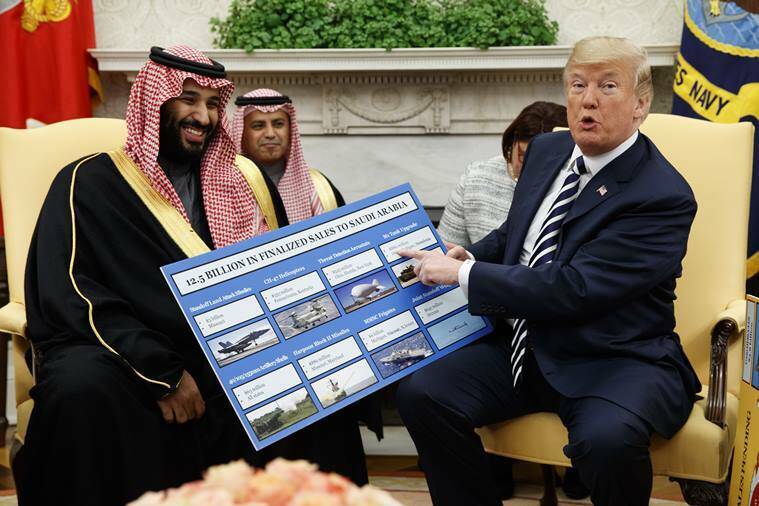 His mild reaction underscored one key truth about Saudi Arabia under MBS. Though he may have set out to transform his country, he’s done nothing to change the country’s utter dependence on the U.S. Trump has so far given the prince a long rein—both at home and abroad. The Khashoggi case may test that forbearance. If MBS loses the confidence of global business, he’s also going to fail in his historic bid to wean Saudi Arabia off oil.